SERENA WILLIAMS was one point away from a memorable rematch. 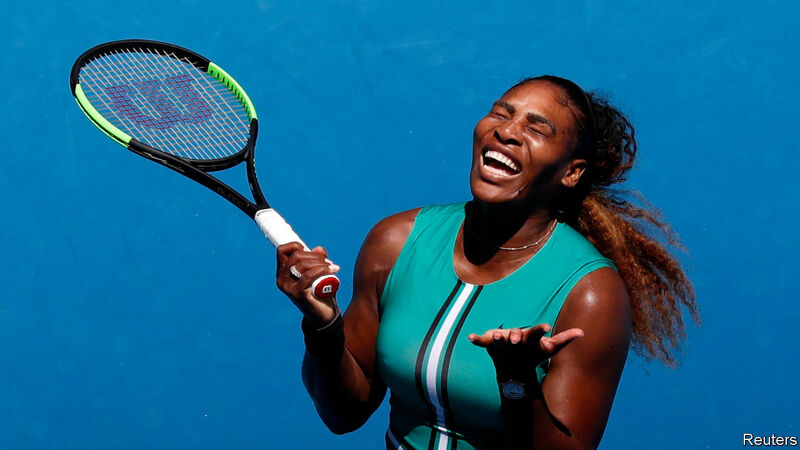 On January 23rd, the 23-time major champion came that close to winning her quarter-final at the Australian Open against Karolina Pliskova, the seventh seed. Victory would have earned Ms Williams a semi-final berth against Naomi Osaka, the 21-year-old who ousted her in last year’s controversial US Open final. But having been 5-1 up in the deciding set in the quarter-final, the most dominant player in modern women’s tennis blew four match points, while yielding a double fault and a rare foot fault (caused by stepping over the baseline while serving). Even more surprisingly, Ms Williams lost 11 consecutive points on her serve, which granted Ms Pliskova a remarkable comeback win. Had the sport’s most reliable champion just endured its biggest ever collapse? Even for ordinary players, losing from match point is extremely unlikely. On the women’s professional circuit, a player who gets that close to winning does so 97% of the time. A simple predictive model, which assumes that the two opponents are of equal strength, suggests that a player serving for the match in a deciding set at 5-1 up and 40-30 should win 98.9% of the time. But Ms Williams is no ordinary player. In her entire grand-slam career, spanning 21 years and nearly 400 matches, she had only previously suffered defeat after gaining match point on two occasions (the last being in 2010). Even at the age of 37—six years older than any other woman ranked in the top 25—and after a year of maternity leave in 2017, the American has continued to tower over her rivals. She reached two finals in 2018, and was the bookmakers’ clear favourite to win this year’s Australian Open. Having knocked out Simona Halep, the top seed, in the fourth round, betting markets gave her a 72% chance of toppling Ms Pliskova. At the first match point, the live odds of the Czech player somehow clawing her way to victory tumbled to 250-1, or 0.4%. Because collecting point-by-point data for tennis matches is a fairly modern practice, we cannot know for sure where this turnaround ranks in the sport’s long history. But among the 2,300-odd women’s contests that have been manually recorded by volunteers for the Match Charting Project, an online repository of tennis data, there is no example of a greater collapse. Most of the project’s sample is composed of high-profile matches from the 21st century, but there are also a handful of grand-slam duels of yore. Tennis’s most notorious choking incident—when Jana Novotna seemingly lost the ability to hit the ball against Steffi Graf in the 1993 Wimbledon final, after serving for game point at 4-1 in the deciding set—looks unremarkable when compared to Ms Williams’ downfall, with a peak win probability of 95.6%. Ms Williams insisted in her post-match press conference that she “did not choke”. Yet the complete disintegration of her serve, which ranks among the most potent of all time, was perhaps even more improbable than her defeat from match point. In the entirety of her third-round match against Dayana Yastremska, an 18-year-old Ukrainian, Ms Williams lost only ten points on her serve. To lose 11 in a row, as she did against Ms Pliskova, is unprecedented. In her previous 131 charted matches, her worst sequence had been seven points—and that was against her sister, Venus, in 2002 on a returner-friendly clay court. It is hard to give any other explanation than that Ms Williams suffered a momentary case of “the yips”. Even the steeliest winners can sometimes lose their nerve. Though Ms Williams has rarely blown her own match points, she has lost her cool at pivotal moments. Last year’s defeat against Ms Osaka was marred by a tussle with the umpire over coaching, which is forbidden during matches. The bickering ended with Ms Williams being docked several points. In a 2009 US Open semi-final against Kim Clijsters, she lost a match after threatening a line judge who had called a foot fault. But the odd tantrum in crucial matches has rarely stopped previous champions from finding their form again (as fans of John McEnroe and Andre Agassi can confirm). Indeed, after the foot-fault-triggered defeat to Ms Clijsters, Ms Williams won two of the next three majors. Nor has her meltdown against Ms Osaka seemed to affect her form this year. She bit her tongue on Wednesday, even as her serves sailed out. She remains likely to earn that rematch with Ms Osaka in a future tournament. If history is any guide, it will once again take place on one of the sport’s biggest stages.